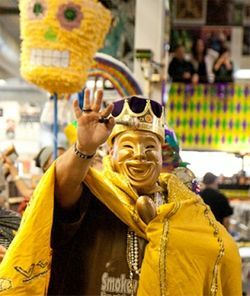 It's Fat Tuesday today, and once again a portion of the proceeds from all three Amoeba stores and Amoeba.com will benefit relief efforts in New Orleans. We're also having our annual Mardi Gras festivities at Amoeba Hollywood and SF. Our family-friendly events start at 3 p.m. at Amoeba Hollywood, with DJ Humble B starting things off, and our annual Mardi Gras parade at 4 p.m, with Mr. Ray on the turntables. At Amoeba SF, we'll have DJs starting at 2 p.m.
A portion of the day's in-store and online proceeds will go to New Orleans charities Tipitina’s Foundation and the New Orleans Musicians’ Clinic. Tipitina’s Foundation seeks to preserve Louisiana and New Orleans’ musical heritage, while New Orleans Musicians’ Clinic is dedicated to providing affordable healthcare to New Orleans musicians. New Orleans continues to recover from the devastation of Hurricane Katrina, one of the costliest and deadliest natural disasters in U.S. history, and at Amoeba we're dedicated to continuing to do our part to help, including raising $1,000 for the New Orleans organizations at our recent charity auction Feb. 7. Fat Tuesday in Christian tradition takes place the day before Ash Wednesday, when you’re supposed to feast and drink and be merry before the penintential season of Lent, leading up to Easter Sunday. Since then it’s also become a global celebration from Brazil to Senegal, full of costumes, festivities, parades and general decadence. Read about the Mardi Gras Indians here at the Amoeblog. Amoeba also is exclusively distributing the "Congo Square" albums, which assemble celebrated musicians such as Levon Helm, Hubert Sumlin and more to trace the development of New Orleans music, with all proceeds of the albums' sale benefiting New Orleans relief efforts. Read more about The Congo Square Project in Billyjam’s interview with Congo Square producer Fabian Jolivet. 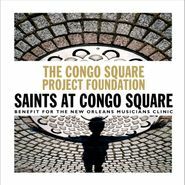 Four albums in the series are out now: The Congo Square Project Foundation: Sacred Ground Vol. 1 and 2, and The Congo Square Project Foundation: Saints at Congo Square Vol. 1 and 2. Additionally we invite you to check out Amoeba.com’s Vinyl Vaults, featuring more than 100 remastered songs by blues great Louis Armstrong, from the years 1923 to 1932, many exclusively available from Amoeba to download for the first time ever. Read more about our Louis Armstrong archives here.